your dentist to understand whether this treatment is suitable for you. dental health of your tooth and gums. There are multiple types of tooth whitening solutions available. There are essentially three categories that these fit into including pharmacy available products, Take Home (from dentist) packages and In-dentist clinic applied solutions. When a whitening product is applied to the tooth, it breaks down into water and oxygen ions. The oxygen ions enter the enamel and attack the long stain molecules to effectively break them down to be short and colourless. These short and colourless molecules are then naturally removed from the tooth by saliva. The intensity of whitening is related to the number of oxygen ions available and the length of time they are on the tooth. they contain. 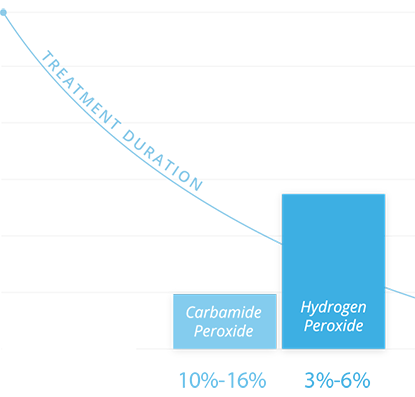 Carbamide peroxide breaks down into hydrogen peroxide over a period of time, but at a lesser strength of active ingredients. achieve the desired whitening effect. Generally, the more active ingredients the product contains the more effective it will be, however above a certain strength requires a dentist to apply and remove the whitening product. In-dentist clinic strength products contain comparatively more active ingredient to achieve the desired whitening effect. These products are administered by dentists to ensure patient safety during the application process. Your dentist will use the pola shade guide to identify your tooth colour. They will also use this scale to estimate how many shades whiter you want your tooth. Each type of whitening utilises a unique application technique to protect your tooth and gums during the whitening process and also long term. Some products contain features that actively protect your tooth and gums during the process, and these can be beneficial as they enable you to achieve the desired whitening effect without incurring damage to your tooth or gums. It’s best to seek your dentist’s advice on which whitening product is most suitable for you and approximately how many shades whiter you are able to achieve.